I went back to the test server to play with the prices a little bit. I had to give myself some ISK to buy the tags off the market. Right now they are not seeded at 100 ISk like everything else is. This feature is important to me, being the feature low sec part, so I'm playing with it and poking at it. My blue wreck issue was resolved as well. The wrecks are now white. I almost feel as if I found a bug. I got all excited about it. Anyway, back to tags 4 sec. Edit: I did find something with the blue wreck problem. I'm so proud of me. I am waiting for my gold star. There are open buy orders for them for 2 million ISK from NPCs. That is a tag sink. People will sell them to NPC buy orders not realizing that there are player orders for more. I can only advise people to put up regional orders over the NPC costs to try to capture these tags before they filter out of the system. These orders are not at the Concord offices but at the CBD Corporation's offices. There are 4 levels of sec gain and each demands different levels of tags. A full sec gain will cost 100 million ISK from -10 to 0 in one swoop. It is one tag per .5 sec. Note: It may be 4 tags at -10 to -8. My sec has gone up to -9 due to ratting. I cannot be sure that I am seeing the correct bottom numbers. Edit Note: I have corrected the chart to show the 4/6/6/4 tag pattern as correct. The higher you go the more you pay, but is that enough or should it be more at higher levels? 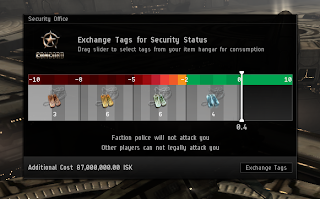 The numbers some were tossing around was 100 million ISK for a full sec wipe. That seems to be about those numbers. It is assumed that the higher levels will be the most common. In my ratting I've pulled only one of the lowest tags (-10 to -8). In general I'm not having any problem finding these NPCs. Their spawn rate is similar to Battleship NPCs in low sec it feels like. Maybe a tad bit less. However, it is much, much, much higher than Faction NPCs of which I found maybe once a week. My next question and adventure was to see how quickly the change applied. I had heard, somewhere that it does not apply until downtime. I decided to pull the trigger and curiously found myself more attached to my sec status than is reasonable. I seem to be using it as an identity. So, I pulled the trigger and upped my sec status to a -8.0. The exchange went smoothly and I was instantly -8.0 sec. My curiousity if gankers will have a 'cool down' period between buying sec and ganking again has been answered. That answer is, "No." People also have asked if they are adding more Concord stations. The answer, as I understand it, is no. One will have to travel for their sec gain. I was also poling people who fly stealth bombers and understand missiles (something I do not) about the feasibility of Stealth Bomber farming. These NPCs are not battleships so the torpedos will not do as much damage (so I think). The Fleet Hurricane makes me happy. Now let me speak of salvage. The changes incoming with Capital Rigs is good on the sensible side of size matching. However, on the side of materials I am having an extreme WTF moment. The difference is 5x what it currently is to build a large rig. These days I build my own rigs and I still salvage when I get a chance. Right now, the way that salvage works I don't see how people will get enough salvage for these rigs. Not even the price just the salvaging of the items themselves. Salvage is a coin toss thing like so many things in Eve. Plus, you need larger wrecks for better salvage and most wrecks are small. What I hope is that it is a buff for salvaging as a career due to the major nerf bat that smashed into it when they removed meta modules and drone goo. What I would liked to have seen is them incorporate some of the unused, super cheap salvage into the capital rigs instead of just adding obscene numbers of the salvage parts that already have the lowest drop rates and highest demands. I have buckets of salvage modules that I do not sell because no one needs them for anything useful. This seems like it would have been a better time to introduce more use across the board, removing dominance from the 'good' salvage NPCs to the 'not worth anything salvage NPCs. It also works when comparing it to current capital ships. They are made from components instead of straight minerals. They are more complex, even in a T1 version. That complexity could be carried over and create more viability inside of the salvage world and help reinvigorate that career. As I wrote this, I had a thought about Orcas. Orcas are a confused ship. Technically, they are Capital Class but actually they behave like battleship type hauling barges. I had a sudden fear that they would not require capital rigs. At this time, their description still lists large rigs. I had this vision of Orca's running around rigless into the future due to cost. 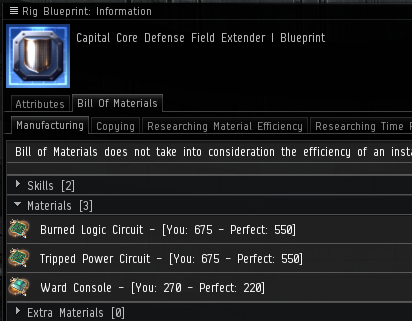 Also, CCP Rise posted an official post that clone costs are being decreased by 30%. Which means some people - like you, it seems - have accumulated a ton of them. There are buyers out there who do nothing but buy a few billions ISK worth of those... (hoping to convert them to trillions at some point, I assume). If you suddendly give them a purpose that generates high demand, you have an imbalance between the actual supply and the pile of stored items. Either (low supply vs demand/use) you'll get prices that are initially quite sensible (also generating instant wealth for some people), probably still quite low, but will rise and rise for quite some time until they are wacky high. Or (reasonably high supply vs demand/use) you'll still have very low prices for those modules initially - because stockpiles are still there - and will only climb out of the valley slowly. The latter is obviously preferable, but it'll be hard to hit the right spot and still make them valuable (but not a bottleneck) in the long run. TLDR: It's a mess and hard to fix now. Aye. My idea isn't the best nor is my hearts dream to use backlogs of salvage. That is something they avoided by adding new tags for instance. It is more of an expand and flesh out the concept some instead of just sticking to the same, bottle necked resources out there. My alt makes some low-end rigs so I'll be interested how this rolls downhill. What I need to find somewhere is a link that feeds from salvage to what rigs they make, I suppose. I know I have some salvage lying around that I kept meaning to scroll through the rigs and see what could be made from them.